Moving Image: 8 minute loop. Location: The French Communist Party Headquarters, Paris. Exhibited: Cité international des arts, Paris, 2016; Tate Exchange, Tate Modern, London, 2018. ‘Revolution Between Two Points’ plays on the politics of motion – how political terms are indebted to the language of movement. 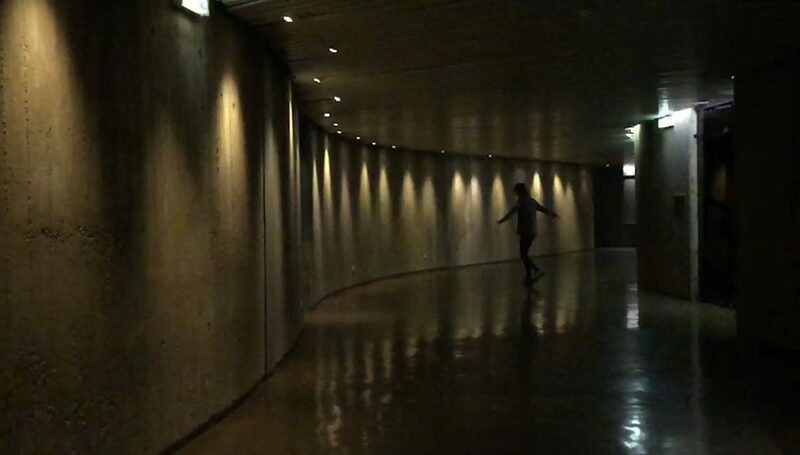 The artist enacts the formal motion of revolution as she spins back and forth within the curvilinear underground corridor of the Communist party Headquarters. The motion is simultaneously physical, mediated and symbolic. It responds to the immediate plasticity of concrete form, and the original gesture of the architect’s hand which draws an architecture that also ‘breaks’ with the efficiency of rectilinear space. Her revolution is both spontaneous and abandoned, running counter to customary patterns of use, but is confined and held between two points through its mediation. The moving imagery is juxtaposed with an archival soundtrack in French of communist politician and writer Louis Aragon addressing the 13th Congress of the French Communist Party on revolutionising the ‘Art of the Party’ in 1954. Aragon argues that a painting depicting a strike is not important because of the strike it represents, but because of the sympathy for the strikers its form can generate among viewers. Artists should therefore employ form and content to promote sympathy, and potentially action, from the viewer.